With Walker Stalker Con NJ 2018 now in the books, here's a chance to take advantage of a special sale to move our overstock. Great gift for your Walking Dead fan at a reduced price! 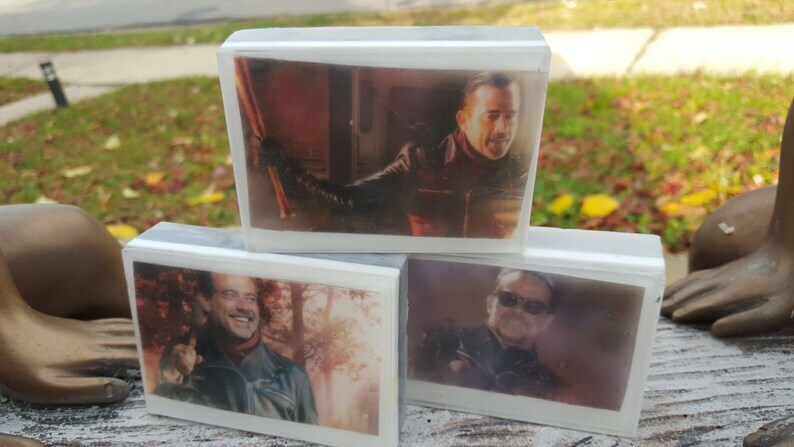 Fans of The Walking Dead will love our series of graphic soaps - each bar celebrates our favorite characters with beautifully unique fan art! Jesus, Rick, Michonne, Carol - all our favorites. Weighing in at almost 5 ounces, these bars measure 3" by 2.5". Each color graphic is printed on water soluble paper which, as the bar is used, will wash away. Scented with our Vanilla Bean oil making this perfect for men and women alike. We are proud to have the artist's permission in printing these bars - and you'll only find them here at AJSweetSoap! Thank you, Carrion Trilevel for your wonderful work! Be sure to check out our entire Walking Dead soap line, including other characters in our Graphic Art bar collection. We always combine shipping on multiple purchases and use flat rate shipping boxes wherever possible. Overages will be refunded once your package is ready to ship. This is a great opportunity to stock up on all your favorites and take advantage of flat rate shipping! Great to share with your Walking Dead fan and perfect for party favors! Please Note: AJSweetSoap has received permission from the artist for use of these images. This soap is our unique creation inspired by the book and television show and is not affiliated or endorsed by the author, publisher or other related entity. It is not a licensed or trademarked product by the author, publisher or other related entity. The book appearing in any photo is for photographic purposes only. The Walking Dead (TM) and all references are licensed trademarks of Robert Kirkman LLC and AMC.